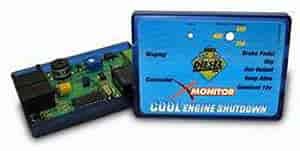 What good is your diesel truck's power if you can't monitor it? X Monitors display three functions simultaneously: boost pressure and exhaust & transmission temperatures. All have limits; when a limit is met or exceeded, the monitor flashes a warning. Choose between a driver's side A-pillar or dashtop mount. Basic accessory kits are also available. Tech Note: Exhaust temperature is monitored by inserting a pyrometer probe in the exhaust flow, which can be mounted before or after the turbocharger. When mounted after the turbo, temperatures vary from 300°F to 1000°F; when mounted before the turbo, 300°F to 1200°F is a normal range during working levels. Choose the temperature not to be exceeded, and that number will flash when achieved. If you don't have enough turbocharger boost pressure under heavy loads, the result can be excessive operating temperatures. Transmission oil temperatures reflect how hard you are working the transmission, and oil breaks down quickly once it reaches 270°F. Extreme temperatures shorten transmission life so setting a 250°F limit is suggested.